Geng Jianyi. Photo: Alessandro Wang. MELANCHOLIC WORDS ARE NOT FOR THIS OCCASION, as they seem too affected for his taste. Having started his artistic career in the mid ’80s with a series of unemotional, grave-looking oil paintings featuring faceless characters, Geng Jianyi, then a fresh graduate of Zhejiang Academy of Fine Arts, produced works considered cynically humorous, reflecting scenes from daily life in an eerie yet ceremonial fashion that, to a certain extent, echoes his most notorious quadriptych painting of hysterical laughing faces, The Second State, 1987. Although he was an artist known for his insatiable curiosity in different media and materials, this cool wit is consistent in his diverse arrays of works. 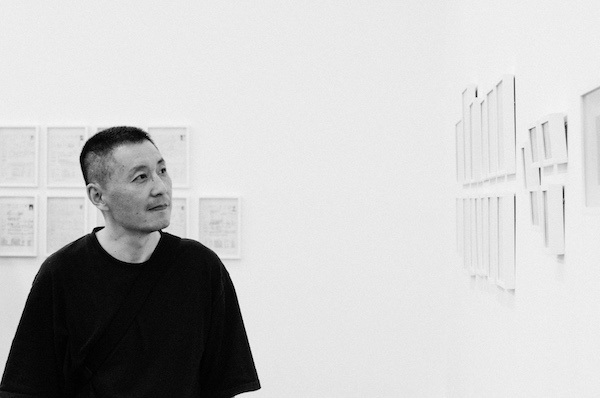 In 1994 and 1995, he initiated “26 November 1994 as a Reason” and “45 Degrees as a Reason,” some of the earliest exhibitions in China that took form in printed matters—in these two cases, postcards. The two projects, not exactly informed by the Conceptual art movement in the West—for instance, Seth Siegelaub’s “Xerox Book,” 1968—were direct reactions to the lack of resources, vitality, and creativity in the art scene of the time. In 2008, after many years of teaching at the China Academy of Art, Geng founded Imagokinetics, an educational platform dedicated to fostering artistic imagination and devising an ongoing lineup of whimsical projects such as Lunar Kitchen (a space that opens once a month with invited art practitioners as head chefs), Kè Táng (standard classes from the Chinese educational system taught by artists), and 8 Hz Hypnotherapy Lab, among many others. “You can never teach art, but only learn it,” he once said when commenting on these projects. To me, he was wonderfully witty and affable, though intrinsically shy and introverted, almost always absent from the openings of his own shows. What I admire most about him was the his inquisitive quality of himself and hisand that of his practices. His works, be they videos, books, certificates, installations, paintings, or any other media, all possess a discernment, oftentimes subtle but never inadequate. And it’s exactly this belief of in using art as a tool to discern that I genuinely share. In the spirit of his “half/half” principle, it might be appropriate to end this passage with yet another one of his quotes: “Both the disciples and pagans of time will eventually be taken out by time.” There’s no need for sadness, really. Qu Chang is the associate curator at Para Site, Hong Kong.